NEWS – While Peter stayed home with as stiff neck a week ago Sunday, Conor had an excellent but abbreviated day for Mid-State of Ohio Kart Club Race No. 5 at Circleville Raceway Park. Peter’s stiff neck was the result of having ridden one too many roller coasters at Cedar Point amusement park earlier in the week. PRACTICE – It was cloudy but dry for most of the morning. After his first practice session, Conor reported that the new spindle/stub axle assemblies we installed on his kart made the steering feel quicker but heavier, but that the handling was fine. Just before the second practice session was about to start, it started to rain. The second practice session was replaced by a track-drying session – first by anyone who wanted to go out on the track in their road car and then by whoever wanted to go out in one of the rental karts. The driver’s meeting got underway about an hour late at 1:00 PM. Because there was more rain forecast for the afternoon, the format was shortened from a normal 8-8-10 lap heat race/feature format to a 3 lap qualifying session, a six lap heat race, and an eight lap feature. 80cc SHIFTER – There were nine karts in Conor’s class again for Race No. 5. We were feeling pretty good about Conor’s chances when we saw that he was the only one who was on new tires – we had taken his two-race-old tires off to use on Peter’s kart, which performs better on slightly used tires than on new ones. Lap times were down because of rain earlier in the day, but Conor managed a 45.817 second lap, which was the fastest of the qualifying session. From pole position in his heat race, he almost bogged down at the start but managed to get away cleanly. He led easily through the first corner, pulled away by three or four tenths of a second per lap, and won by just over three seconds. He recorded a 45.526 second lap in the process. As the other classes were concluding their heat races, the wind picked up, the temperature dropped by about 10 degrees, and the skies drew darker. It began to sprinkle during the mandatory break to allow the corner workers a lunch break. In the event of rain before the feature races are concluded, which ended up being the case on Sunday, points are awarded based on earned starting positions for the feature. Since Conor would have started on the pole, he collected maximum points for the day. NEXT RACE – The early conclusion to the day was a welcome development in what had been predicted to be an uncomfortably hot Father’s Day. Peter was feeling better a day or so later, so he’ll be ready for MSOKC Race No. 6 on Sunday, July 1, 2012, which is a reverse-direction (clockwise) event at CRP. This event features qualifying again, which suits us just fine. p.s., Lap times, lap charts, and results can be found here http://www.mylaps.com/results/showevent.jsp?id=795904. NEWS – Our win streak in Peter's Spec 100 Pipe kart continued, but our streak of races without a mechanical ‘DNF’ (did not finish) ended a week ago Sunday during Mid-State of Ohio Kart Club Race No. 4 at Circleville Raceway Park. Our last mechanical DNF was when Conor’s clutch broke during a Great Lakes Sprint Series race in April 2008. Peter was back with us for Race No. 4 following the completion of his season of rowing with UA Crew. Henry, who is home following his college graduation, also joined us as a member of the pit crew. Race No. 4 followed the normal heat race format except that all classes used standing starts (like the 80cc Shifter class) instead of the normal rolling starts. PRACTICE – About the only thing we did between Race Nos. 3 and 4 was to flip tires around and make a few repairs to the seat in Peter’s kart, to which we had to bolt an additional 20 lbs of lead to bring Conor up to the minimum required weight when he used it for Race No. 3. I also adjusted the brakes on Peter’s kart, which almost came back to haunt him later in the day. 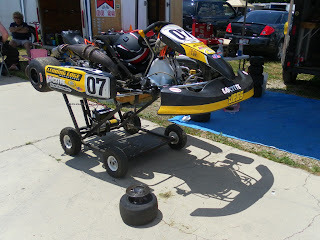 SPEC 100 PIPE – Peter’s class was comprised of five karts for Race No. 4. He started his two heat races from the fourth and second positions, respectively. 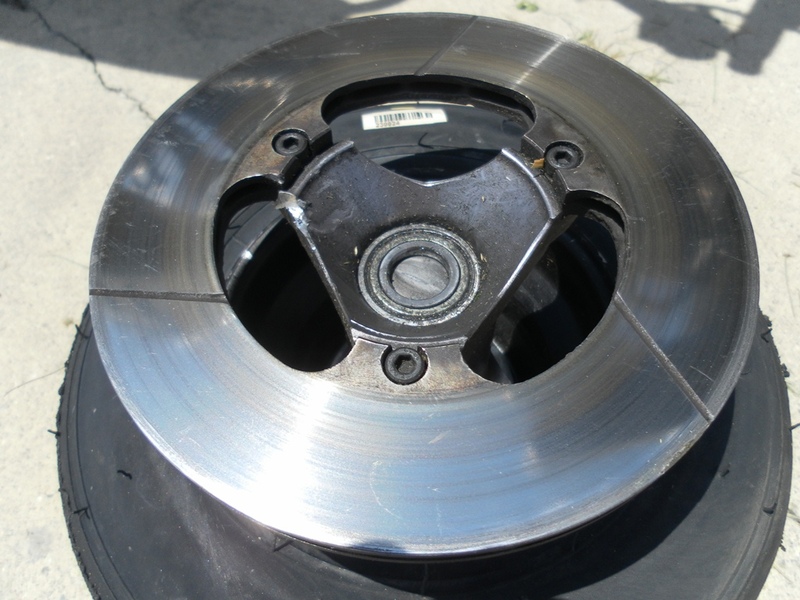 I thought that the three-disk dry clutch that we use would have an advantage during standing starts over the wet clutches that others in this class use, but this did not turn out to be the case. In both heats, everyone maintained their position at the start. In fact, everyone maintained their position throughout the entirety of both heat races. The karts in this class have become so close in lap times that there was no passing – the winner of the first heat finished last in the second and the last place finisher in the first heat won the second. The only drama in the heat races was when Peter had a half spin entering Turn 3 about midway through the first heat. It turns out that his chief mechanic forgot to tighten one of his brake pads, which caused the spin. The kart behind Peter had had a half spin while avoiding him, so no positions were changed. A fourth and a second earned Peter the second starting position for the feature. With everyone running lap times that were so close, we decided to make a pretty radical change in an attempt to give Peter an advantage. Everyone maintained their position at the start again. Peter got a good run through Turn 4 on Lap 2 and was able to make a pass for the lead entering Turn 5. The change we made had the desired effect, as Peter increased his lead slightly on nearly every lap and set the fastest lap time of the day (46.389 seconds) in the process. Peter is now three-for-three in feature race wins in this class this season with Conor having won the fourth. 80cc SHIFTER – There were nine karts in Conor’s class for Race No. 4. He drew the second starting position for his first heat race. One kart was slow to leave the formation grid in the pit area, which meant that the other karts had to sit on the starting grid for an inordinately long period of time before the starting procedure began. This seems to have caught Conor off guard, as when the green flag did fall, he made an uncharacteristically poor start. By the time he got fully up to speed, he had dropped to the tail end of the field. It turns out that his poor start didn’t make any difference. As he was working his way back toward the front, his right front wheel became detached in Turn 7 on Lap 6 and went rolling into the grass. When we got his kart back to the pits, we discovered that his right front stub axle had broken (see pictures here). This is an item for which we do not have a spare, so Conor’s day came to an early end. NEXT RACE – Peter’s kart is ready to go for MSOKC Race No. 5, but finding replacement parts for a 10-year-old chassis from a kart manufacturer that is no longer in business was difficult. 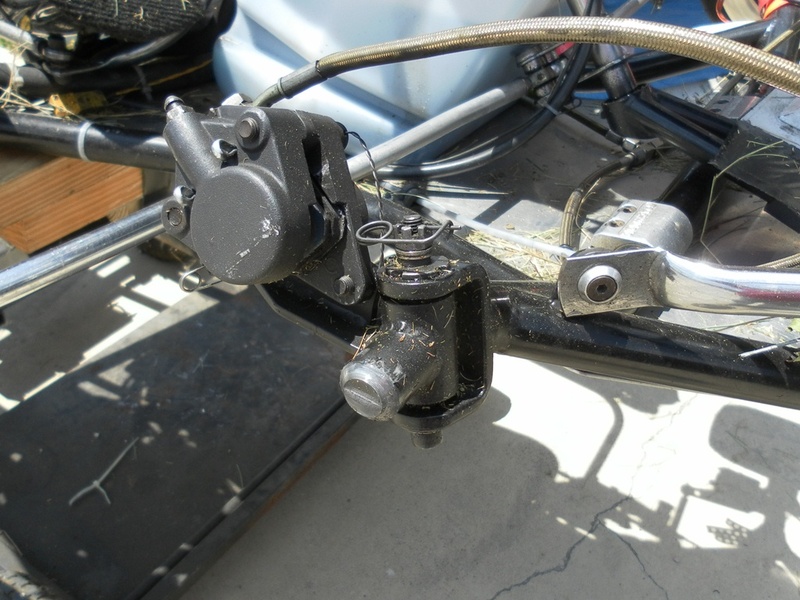 I ended up finding a pair of new spindle/stub axle assemblies for a similar chassis that, with a few modifications, seem to work on Conor’s kart. We’ll find out how well they work soon enough, as Race No. 5 is this Sunday, June 17, 2012, at CRP. p.s., Lap times, lap charts, and results from Race No. 4 can be found here. Peter got another hard-earned win yesterday, but Conor had a rare (for us) mechanical DNF (did not finish) - see pictures below (click to enlarge). A full race report will follow.